Burnham was one of the men responsible for planning Chicago’s iconic lakefront, a public space that I have been privileged to use during the past three years as a student at Loyola University Chicago. He was also responsible for early visions of the Cleveland Group Plan, which included the mall and other grand civic buildings in downtown Cleveland. Maybe Burnham’s forewarning to his City Beautiful peers was directed more towards public spaces, but I’d like to think it applies to young changemakers in Cleveland as well. Since day one, I have felt privileged to be selected as an intern in the Cleveland Foundation’s Summer Internship Program. The story of the foundation’s beginning in 1914 as the first community foundation in the world and its work over the past 102 years to make Cleveland better for everyone resonate with my passion for urban progress. 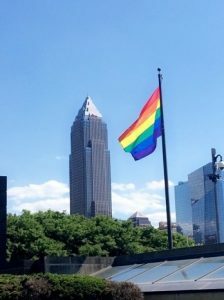 I felt particularly valued by the Cleveland Foundation after it announced $150,000 in grants to support the Northeast Ohio LGBT community shortly after the deadliest mass shooting in American history at an LGBT nightclub in Orlando this past June. I am proud to be affiliated with an organization that is committed to all of Cleveland’s communities – especially when they are hurting. Through the foundation’s internship program I have been placed at CEOs for Cities, an organization that fosters cross-sector collaboration in cities across the US and Canada. The organization was originally founded on the same shores that Burnham famously planned in Chicago and subsequently was moved to Cleveland by CEO and former Lt. Governor of Ohio Lee Fisher. As an intern at CEOs for Cities, I have been challenged to think big, and to look at urban progress through a cross-sector lens. My work at CEOs for Cities largely involves independent research. As an advocate for public transit, walkability, and other alternative transit, I have been studying the tendency of Clevelanders to use cars even while walkable districts are quickly developing, the Greater Cleveland Rapid Transit Authority is modernizing its system and new bike infrastructure is being added the city each year. As I am pushed to take that extra step in my day to network or attend a professional development event, Daniel Burnham’s words ring true. With every opportunity I take to make more connections, the push to make no little plans in terms of my educational attainment and professional aspirations becomes more salient. My experience as a Cleveland Foundation intern and my research with CEOs for Cities is a small step in my big plans for how the Greater Cleveland region can be more sustainable, economically prosperous and socially equitable in the future. Daniel Drees, a senior at Loyola University majoring in Political Science, is placed at CEOs for Cities. Daniel assists with academic research, policy analysis, writing, and presentation of case studies profiling successful projects and initiatives in mid-sized cities similar to Cleveland across the CEOs for Cities network.